| New York, NY - June 19, 2018 | Wolf-Gordon showcases the evolution of Dutch designer Mae Engelgeer’s craft with the release of the MATTER collection, an upholstery series that offers new luxury in commercial fabrics with an unparalleled visual appeal. Three patterns—Mass, Merge and Points—convey the tension between what is expressed as design via surface texture and the less revealed depth of concept, reminiscent of what is perceived behind a veil. The interplay of high loft wool blend yarns with chic metallic filaments makes for a visually rich and tactile collection, complemented by intricate detailing, geometric and organic forms. All three items achieved 100,000 double rubs on the Wyzenbeek abrasion test. The three patterns also provide a variety of scales for commercial designers to select from and combine in harmonious, sophisticated color palettes. The MATTER collection will be previewed at NeoCon 2018 in Wolf-Gordon’s 10th floor showroom, 10-161, alongside the company’s extensive lines of upholstery, drapery, wallcovering, wall protection and specialty coatings. "We are thrilled to be working with Mae Engelgeer on this second collection for Wolf-Gordon. Mae’s conceptual strength and ongoing experimentation in textile design enrich our upholstery collection and the overall vitality of Wolf-Gordon as a design force in commercial markets." MATTER was developed in The Netherlands at the TextielLab, a favorite location of Engelgeer’s to ideate and create. She worked closely with a developer to translate her ideas into a workable programme for the dornier weaving machines, and the collection grew from a process of adjusting in real time, whether it be changes in color, scale or binding. This method allowed Engelgeer to make unexpected changes in each design and pushed the collection to the next level. "When I started this collection, I had a clear feeling and atmosphere I was aiming for, but it was still a bit abstract. Now, when I see the designs together, I think, ‘Yes, this is what I had envisioned.'" Engelgeer’s colors for MATTER are exquisite in their relevance for commercial interiors. Warm and cool neutrals, blues and off-reds span light to dark values. The products are designed and colored to work in combination, all within the same sensibility of luxury and texture, and metallic filaments introduce yellow gold, rose gold and silver to the matte wool blends. Mass interprets the flecked composition of terrazzo in a dramatically spaced, magnified version. The design superposes stone-like floats, with a metallic ombre effect, to a high loft solid ground. 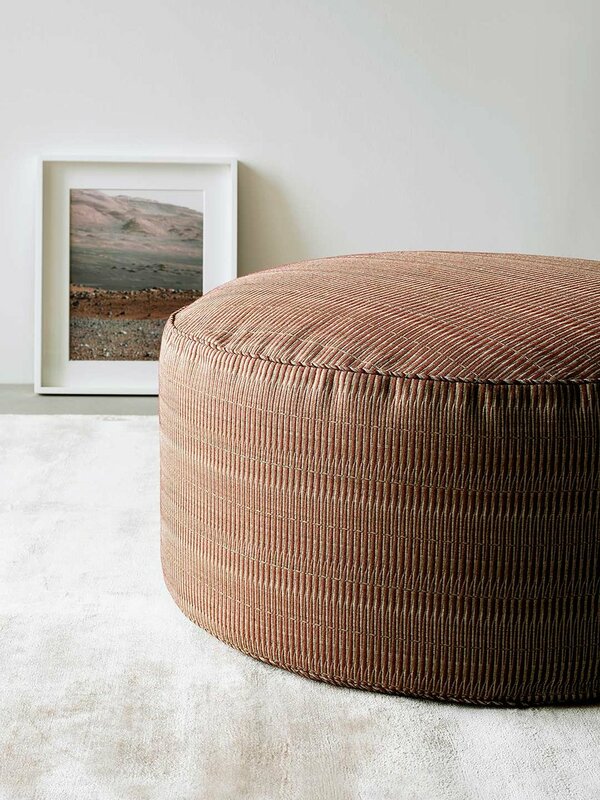 Fine metallic yarns impart dimension and light, juxtaposed with dense cotton-wool-nylon yarns. Mass comes in six colorways: Charcoal, Lake, Mahogany, Soft Brick, Fawn and Cashmere. Merge has a wool-cotton-nylon base that appears “cabled” as the linear composition travels in S-curves across the width of the fabric. Metallic yarns, braided in, add a contemporary look and textural appeal. Merge’s directional quality is counterbalanced by perpendicular elements that result in a complex yet composed structure. The Eastern concept of stillness in motion and motion in stillness is suggested. Merge is offered in six colorways: Copper Wire, Starlight, Sand Jewel, Cinnamon, Persian Red and Gold Bracelet. Points is a plush polyester-nylon-wool blend that charts a grid of small dots atop an organic granite-like pattern. The dots almost seem to be surfacing from behind a gauze-y veil in this highly usable, small scale design. Points comes in eight colorways: Deep Space, Spring Pond, Granite, Wool, Saffron, Brocade, Unity and Pearl.